When Google Search updated yesterday, bringing with it “real time package tracking from select carriers” to Google Now, we were curious as to what carriers Google was referring to and exactly what “real time” means to them. For one, I have a couple of packages currently coming via UPS and neither are showing anything different from what we have seen since they first introduced the original package tracking. So what do they mean? 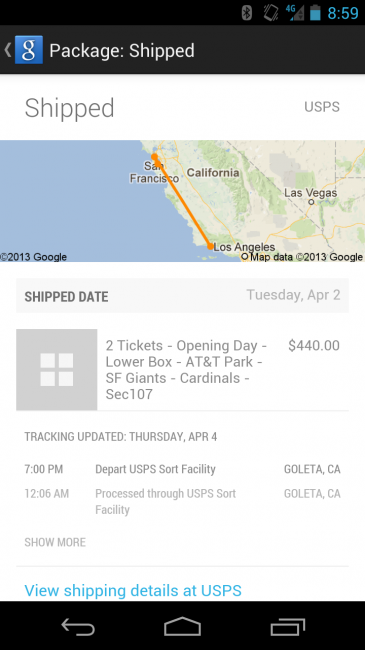 USPS with maps, itemized tracking, order recaps, and more. A long time reader of ours sent in the screenshot above for tickets he had ordered to an upcoming San Francisco Giants game. Clearly, he is seeing new tracking information and USPS must be one of the select carriers that Google was referring to. There is a map that shows the starting shipping point to the end delivery, an itemized breakdown of each stop along the way, a summary of his ticket order and a “more” link to provide additional details. So rather than the “Track Package” link opening up the browser and the shipping company’s website with tracking information, Google is trying to give you as much or more info without forcing you to leave Google Now. I know I’m a fan – I just wish it would roll out to UPS already. Facebook Announces New Android Skin/Launcher/App Pack Dubbed "Home"